It’s no secret that Washington, D.C. is full of fabulous museums to visit. As a family, we enjoy them all. But for kids, not all museums are equal. 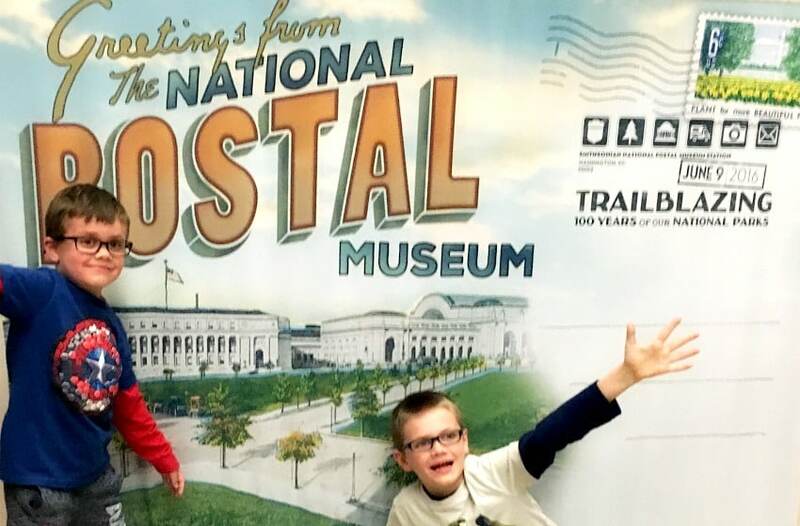 My kids love the National Postal Museum because it really is for them! 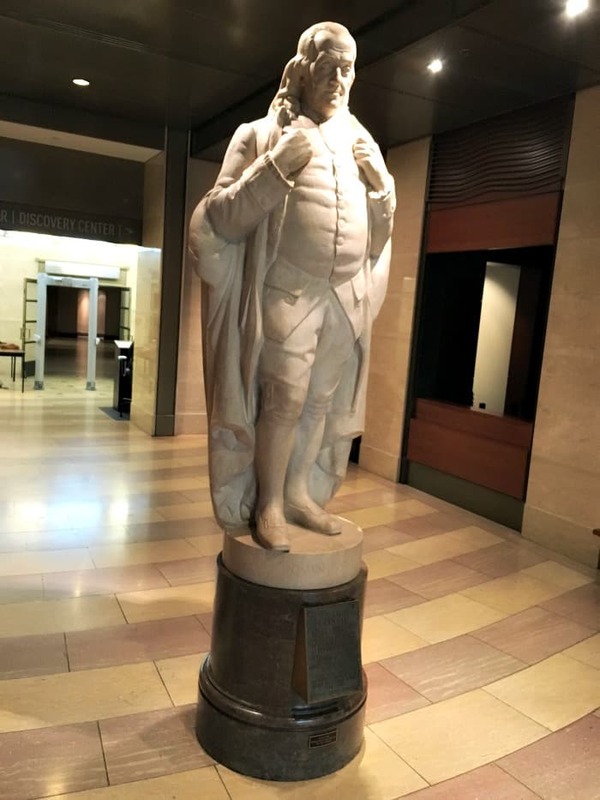 On our visit to DC last year, we visited the National Portrait Gallery, a total rookie mistake. While my husband and I loved walking the quiet halls admiring the incredible artwork and there were a few kid-friendly options, we spent the majority of our time saying, “don’t touch that!” It was stressful for us and I’m sure not the most awesome experience for the kids. We made it work, but the lesson was learned. This year, I sought out a few more kid-friendly options. 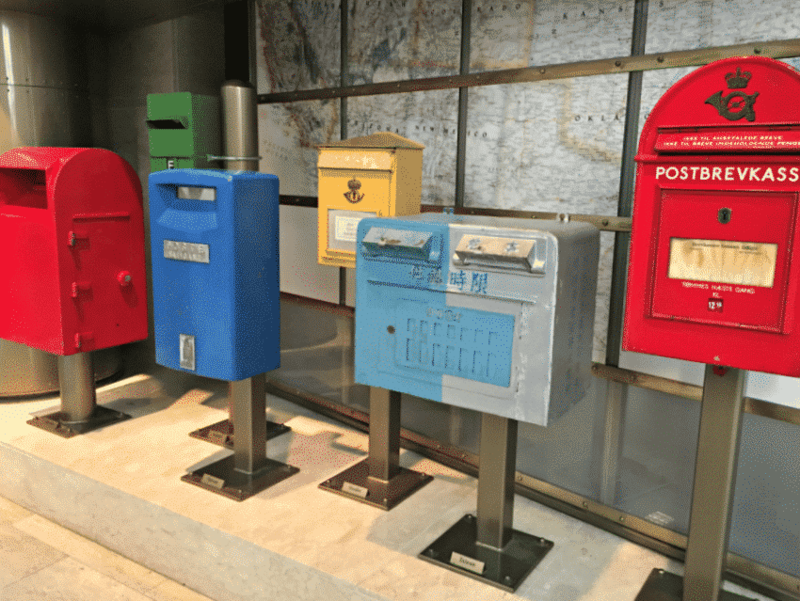 I found out about the National Postal Museum in an article written by my friend Jessica, and I knew it was perfect. We hopped on the DC Circulator bus right outside our hotel (see my review here), and rode all the way to Union Station, which is located right next door to the museum. After a quick security check, we were inside. I love DC architecture and this place did not disappoint. 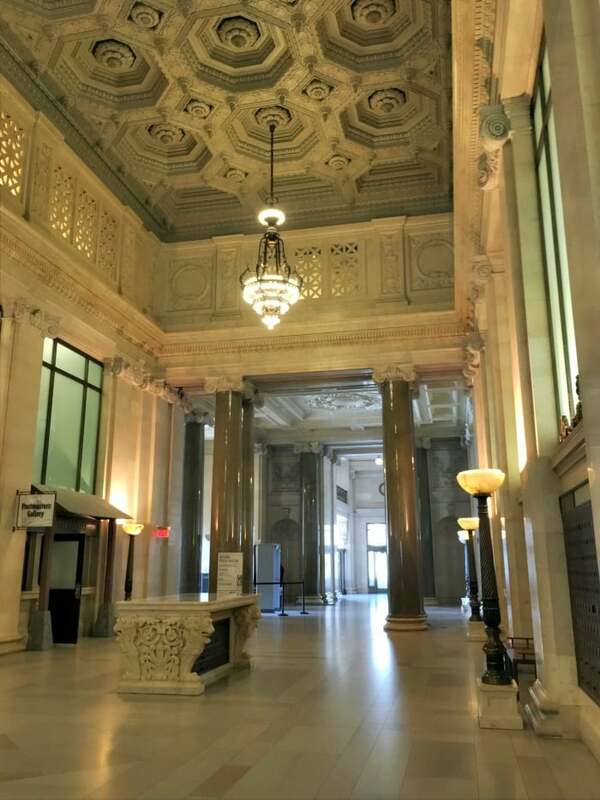 Just look at that ceiling! We decided to head down to the first floor to leave our coats in a locker. Since it was in the 3os during our visit, we had tons of winter gear we didn’t want to bother with. Love having a locker! Just about everything on the first floor has an interactive element. 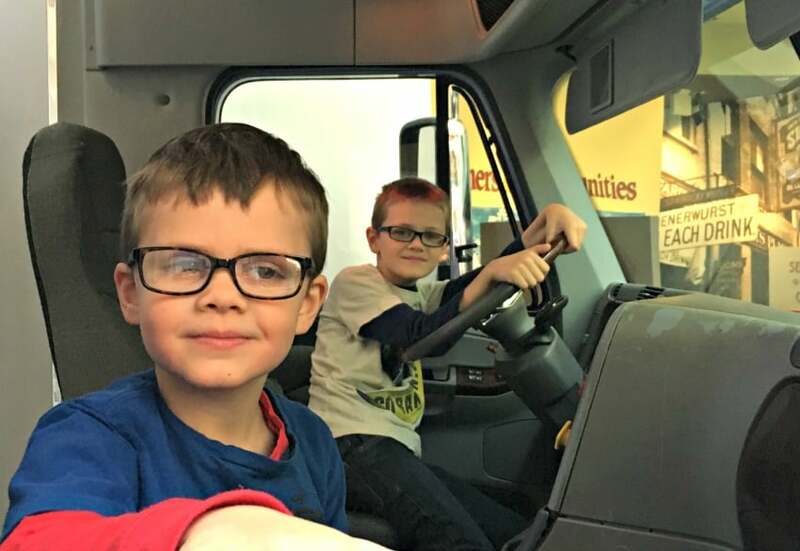 I loved looking at the old mailboxes and the boys had fun sorting mail, pretending to drive a semi-truck and walking the “King’s Best Highway”, where mail was first sent between New York and Boston. Did you know you can send a coconut in the mail? It’s true! 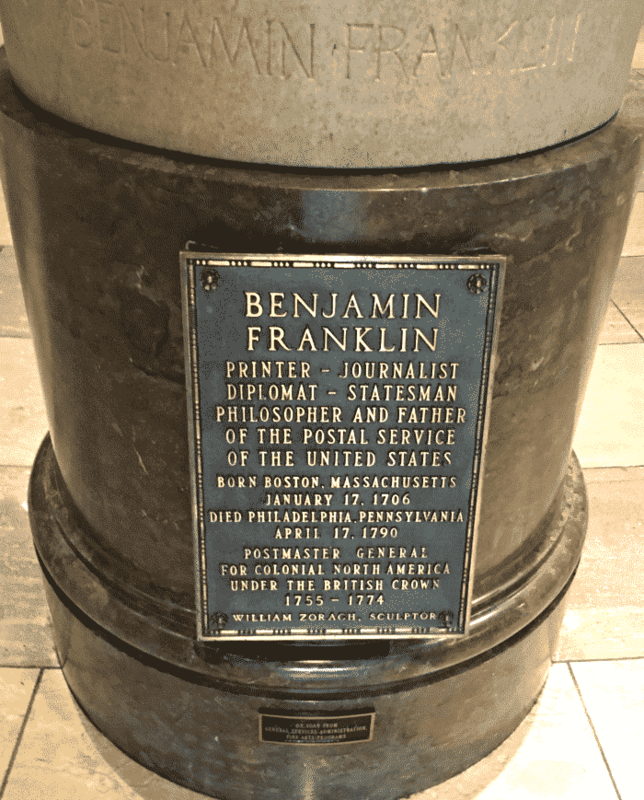 Here’s a fun fact for those of you who think the lightning rod is the only thing we have to thank Ben Franklin for (outside of that whole Founding Father thing). He is also considered the Father of the United States Postal Service! I have to say, this was news to me and I was so fascinated to learn more about him. 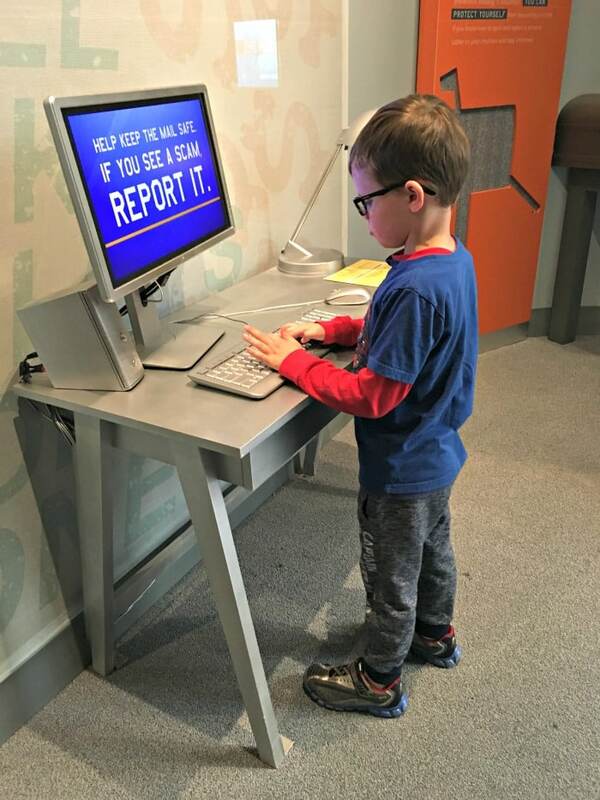 There are several different exhibit rooms with lots of fun for the kids. 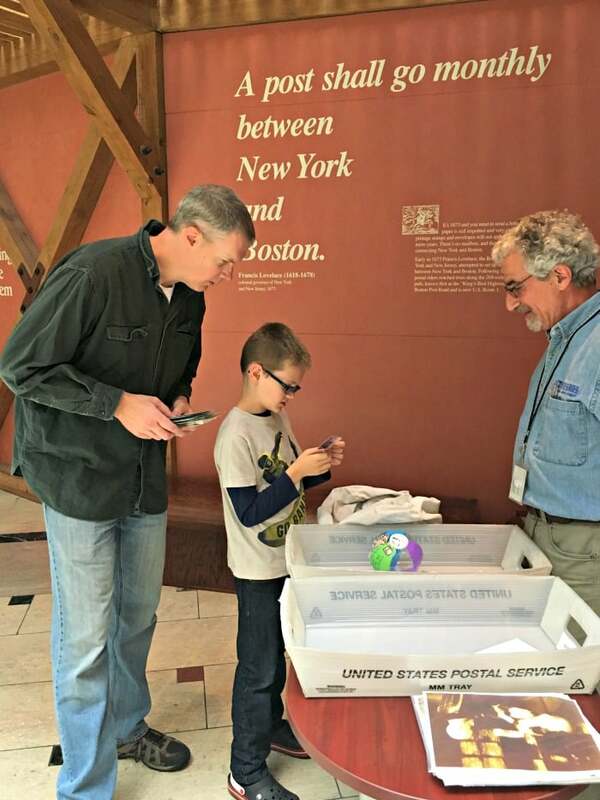 We walked a timeline of the postal service with hands-on activities like sorting boxes and scanning labels (Calvin loved that part). 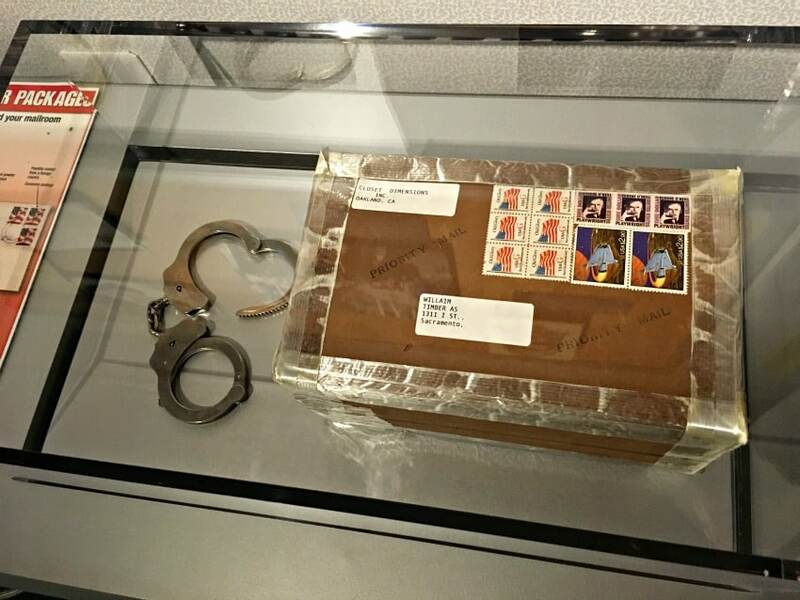 We also learned about mail fraud and marveled at the actual handcuffs used to arrest the Unabomber. Seeing some of the letters that contained anthrax in the post-9/11 days was definitely eerie. Upstairs is an entire room dedicated to stamps dating all the way back to the first one. They are sorted by decade and I could have spent a very long time looking at them. Do you love stamps? I’ve always had a little soft spot for them and even had a stamp collection when I was a kid. In this area, there is a table where kids are allowed to sift through old canceled stamps from all over the world and keep five of them for free as a souvenir. There’s also a computer where you can design your own stamp memento, which is emailed to you and also free! 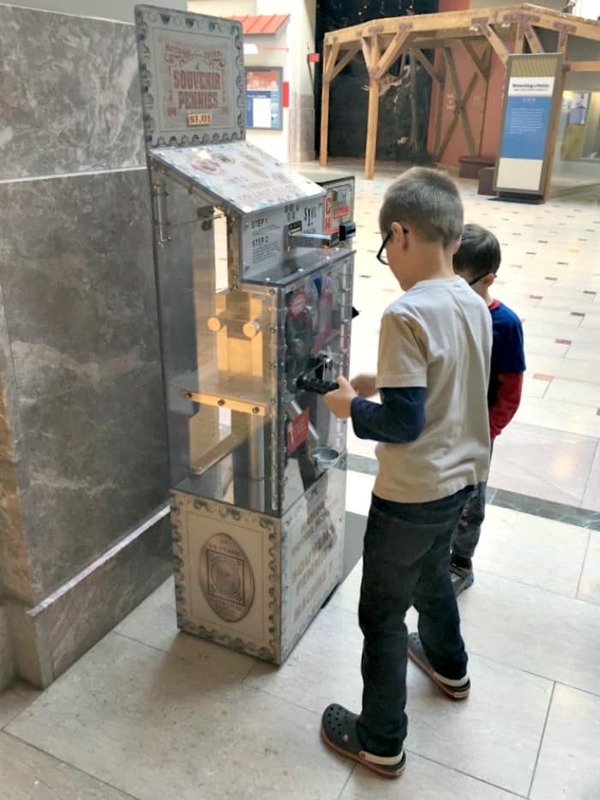 Of course, we’ve never met a pressed penny machine we didn’t like so this little souvenir was a must and on the way out, we made sure to pick up a free postcard. 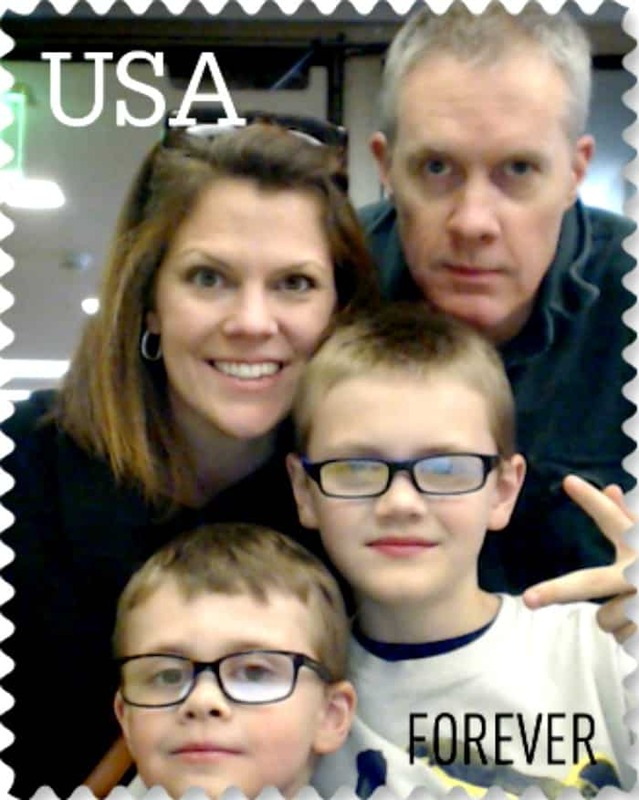 The National Postal Museum was definitely one of the highlights of our spring break vacation. The history was fascinating for us adults and it was so relaxing to let the kids move around, touch things and just be kids after being so patient at the more grown-up attractions. If you’re planning a trip to Washington, DC with your family, you’ll definitely want to add this stop to your itinerary. 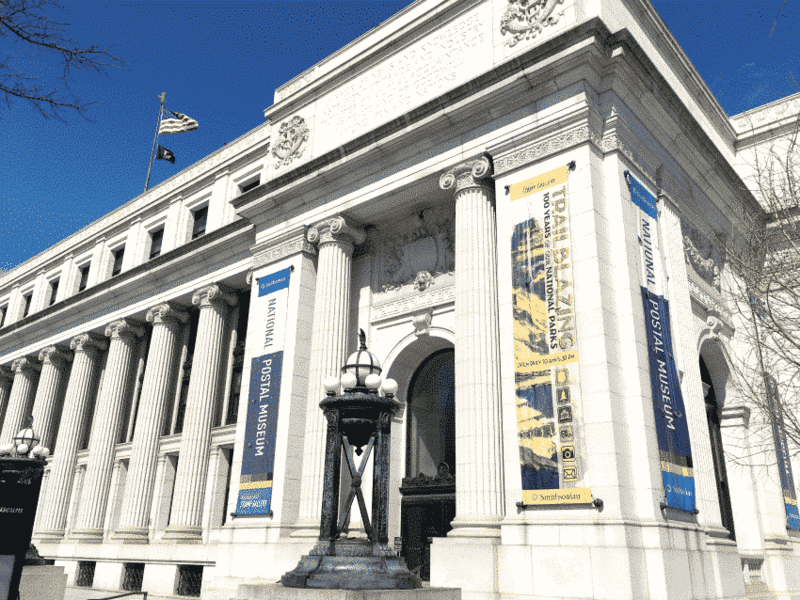 Like all Smithsonian museums, admission is free and you’ll want to plan to be there for 2-3 hours.Check out hours and visitor information on the website and enjoy! 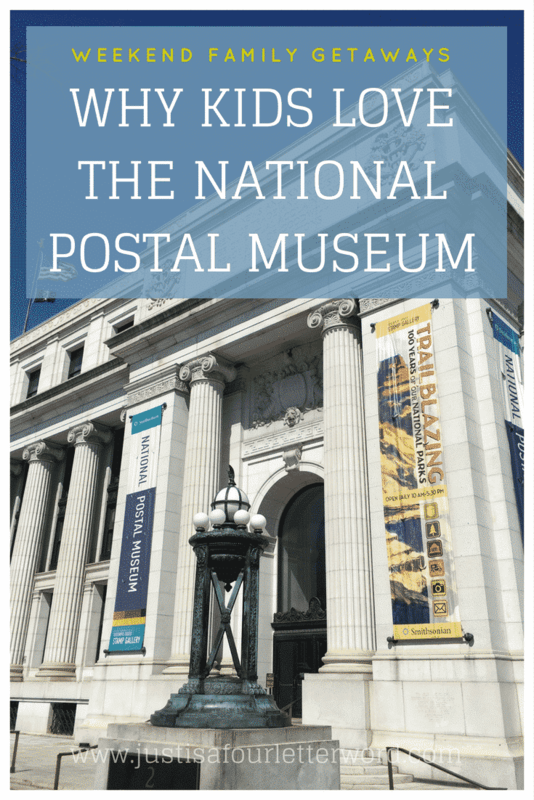 Have you been to the National Postal Museum? What was your favorite activity? Hotel Indigo Asheville: The Perfect Home-Base for a Kid-Free Weekend! Is Pixar Play Zone Worth the Price?